As many others who have come before me and therefore know very well, there are numerous not-so-pleasant side effects of pregnancy. The joys certainly outweigh any negativity, but the downsides are definitely there and cannot be ignored. I consider them a part of the initation to motherhood – a trial period that comes in advance to being a part of a special club that only those who are members seem to understand. The latest symptom that I have had to embrace is heartburn. I must admit, it wasn’t until the last couple of days that I realized what it actually felt like. I thought heartburn was a pain in your heart (hence the name?!) – so the extreme pain/burning I have experienced in my chest and throat seemed foreign to me until my pregnancy blogs told me otherwise. And just as the face breakouts, extra fluid, and frequent urination side effects before – it will most likely get worse before better. NOT that I am complaining. It is totally worth it for her – which, by the way, I am reminded about everytime I feel the joy of a kick caused by the life growing inside me each day. I just want to record it so I remember every minute of this pregnancy to tell her all about one day. So, as previously posted, I traveled on my final flight before baby last week – on my annual field trip with my students to New York City. Although my 6-month pregnant body was certainly not as energized as it has been in the past, the trip was still a success. My students were well-behaved (and even offered OFTEN to carry my bag), the weather was uncharacteristically warm, and I was able to find a few perfect purchases for my daughter-to-be. But the highest point of the trip definitely came on Friday night, upon my return home. 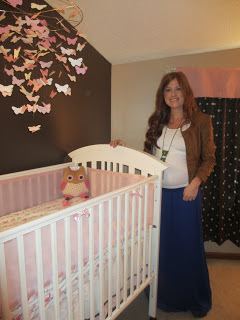 My husband, Mr. BB, had spent his three days with one goal in mind – a “While You Were Out” surprise interior decorating job on our future baby’s nursery. 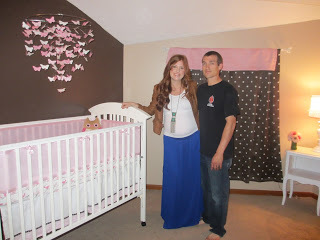 From the time I left (Wednesday AM) to my return (Friday evening) … he successfully (1) painted all four walls of the room, (2) picked up & assembled the crib, (3) purchased a mattress/bumper for the crib, (4) selected, purchased, and assembled curtains, a curtain rod, and a rather adorable lamp. Oh yeah, and he cleaned my car, cleaned the house, and bought me flowers. I seriously think he is going for “Husband/Dad of the Year.” And for the record – he gets my vote. It’s that time of year again … the end of the March, that is, which signals my annual Fashion Marketing trip to New York City. The trip is always jam-packed, lots of walking, and of course, endless shopping. 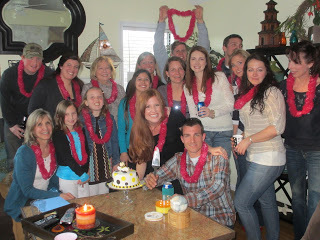 Last year, my focus was on outfits for wedding showers, rehearsal dinners, and our honeymoon to the Bahamas. This year? Obviously, the focus is on Baby-Girl-To-Be. And even though she already has a wide variety of pink dresses, leggings, bows, skinny jeans, esc. (one that would make any newborn in the nursery the slightest bit jealous) … making a few additions to her growing wardrobe certainly remains a priority for the trip. Other thoughts before we (baby & me) ﻿depart on the plane to the La Guardia airport? Well for one, to keep my precious cargo safe & sound. Although my doctor gave me the go-ahead for the trip, I clearly have to think more about my health this year. For the first year, my heels have to stay at home. And lots of water and food to keep my energy up are on the menu. So we are off for Little Miss Brickner’s first (but definitely not the last) trip to the Big Apple. The time really is flying by. I can hardly believe that I am 22 weeks pregnant and OVER halfway to the finish line – also known as the day I get to meet Baby Brickner for the first time. It doesn’t seem long ago that I was wearing the tightest shirts possible in effort to draw attention to my “barely” there baby bump. 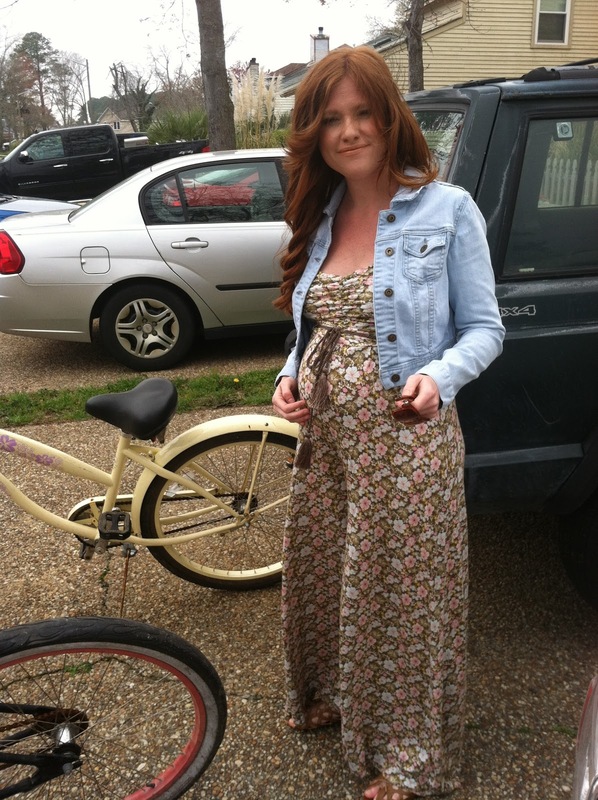 I realize this sounds backwards … but I seriously went from wearing flowy silhouettes pre-preganancy to slim ones from the very first days because I was so proud of the bump I was beginning to show. These days, there is little reason to find the tightest shirts in my closet, as my stomache has grown to the point where it is quite obvious regardless. Yes, there is definitely a baby growing in there and she seems to be getting bigger everyday. In fact, last week marked the point where it became essential for new undies & bras. I was starting to have indented lines all over the areas where my previous ones clearly didn’t fit. It is hard to imagine what my bump will be like come July. But the fact remains that I am honored to carry this little princess each & every day. My PINK Cloud of PURE Happiness! 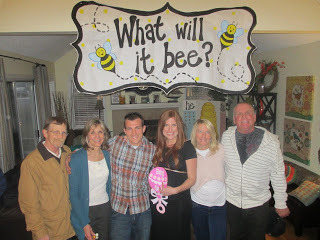 I still cannot believe that Baby Brickner is a SHE!!!! This is ALMOST as shocking as finding out that I was pregnant four months ago. Visions of giant floral headbands, tutus, and colored tights are officially dancing in my head. I seriously would have been happy EITHER WAY, and I mean it when I say that, but the thought of having a daughter is absolutely exhilerating. 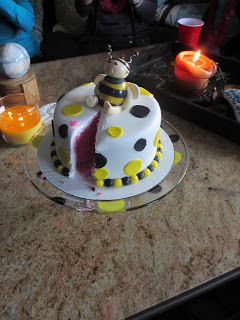 A special thank you to my mom and sister-in-law for planning the details of the ADORABLE bumblebee themed party, and to my dad for following it through. I know Little Miss Brickner already loves each of you.